The ancient proverb, “Necessity is the mother of invention” is how Redonkulary® started. I invented a fun word game to entertain my children while on the road. Redonkulary® became my secret weapon, which I deployed to combat boredom whenever it threatened to disrupt the peace. 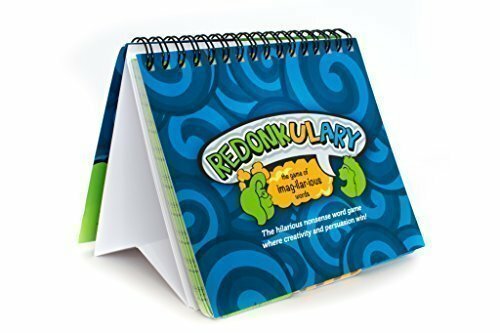 Our friends and family of all ages and backgrounds loved Redonkulary® so much whenever we played it with them, that I realized this game had broad appeal. Following my lifelong dream of making a difference in the lives of others, I decided to turn my passion into my profession. I quit my corporate job and started my own company to turn Redonkulary® into a sharable product. Now everyone can play Redonkulary®! Kristin Miller Burrell is a woman who embodies unexpected combinations, just like the game she invented, and she is no stranger to taking leaps of faith—literally. As a child, Kristin dreamed of flying, so she earned an Army ROTC scholarship to college, received a Regular Army commission, and got into flight school before discovering she was medically disqualified to become a pilot. But she served with distinction as an officer in the United States Army for 7 years anyway, where she jumped out of airplanes as a paratrooper, qualified as an expert marksman and received the “One-Shot, One-Kill” target-shooting award. She was the Army ROTC Color Guard Commander at the University of Southern California. In law school, she published an article about human rights abuses against women in Iran. She is an animal lover and dog rescuer who keeps her pet rabbit in a deluxe outdoor dog run. She served as a Stephen Minister at her church, where she also won the 2014 Chili Cook-Off. She lived in Germany as an Army brat and in France as an ex-pat. She visits a 95-year-old woman at a nursing home. She was in the movie “Renaissance Man,” starring Danny DeVito, as a soldier. And she’s the mother of two school-aged daughters who describe her as “loud, proactive, sometimes funny, brave, and dramatic.” What? Exactly. Redonkulous. Kristin brings her courage, determination and entrepreneurial spirit to all of her endeavors, and is as creative, loving and kind as she is strategic. She is thrilled to be finally manifesting her vision of making the world a brighter place by spreading joy, community and laughter. Vistavation LLC is a 100% veteran-owned and woman-owned small business that innovates, invents, researches, and develops consumer products. Vistavation LLC developed Redonkulary®, the hilarious word game where creativity and persuasion win!